I will be at the Carlsbad Music Festival on Saturday, June 18th. It is a beautiful event with lots of fun things !! Adventurous music invades the seaside Village of Carlsbad! 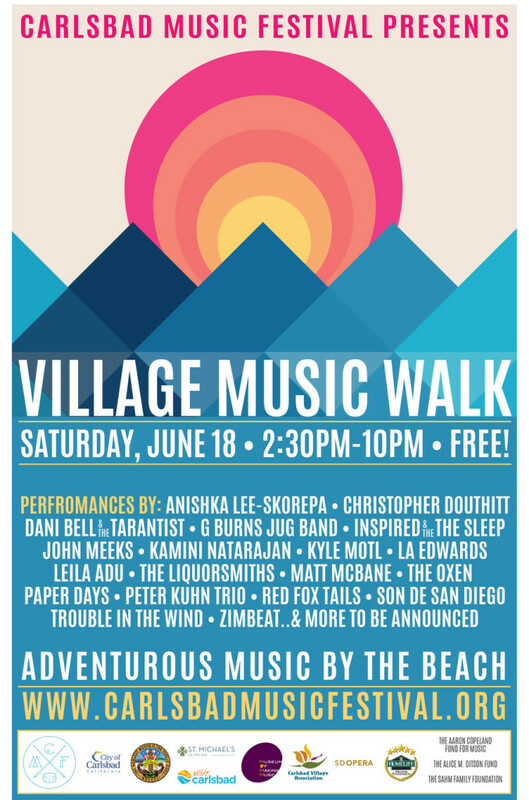 We’re super excited to share with you the details of this year’s Village Music Walk! Join us on Saturday, June 18th from 2:30pm – 10:00pm for a day of adventurous music and fun by the beach. Over 30 performers will take the stage at locations around the Village, plus here will be a beer garden, food trucks, an artisan market and much more. We’re also excited to announce our first round of performers (click here for more info) which includes San Diego Opera Soprano Anishka Lee-Skorepa, Christopher Douthitt, Dani Bell and the Tarantist, G Burns Jug Band, Inspired and the Sleep, John Meeks, Kamini Natarajan, Kyle Motl, LA Edwards, Leila Adu, The Liquorsmiths, Carlsbad Music Festival Founder Matt McBane, The Oxen, Paper Days, Peter Kuhn Trio, Red Fox Tails, Son de San Diego, Trouble in the Wind, Zimbeat and more to be announced!